The reputation Climax has earned for itself - one of them, anyway - is that it's the most likable, audience-friendly feature of the five made by infamous French provocateur Gaspar Noé. The best I can come up with is that this is a polite way of saying "no explicit cumshots in this one", because there's not really any sense in which Climax is audience-friendly at all. A tremendous piece of cinema, for good or bad, but not audience-friendly. What is this softer, gentler, more mainstream Noé picture, anyway? It's simple enough to sketch out: in 1996, on a snowy night, an modern dance group rehearses its newest number in a small auditorium, as part of the lead-up to a spate of practice that will end with an international tour. With the dance behind them, everybody celebrates with a couple bowls of sangria, but one of them has mischief in mind: the sangria was spiked with LSD, and so a whole room full of people wracked with all of the internal tensions any group of self-styled radical artists will be stuck with ends up having an exceedingly bad trip, with everybody rolling around and dancing formlessly and screaming in horror, pain, and rage, before the morning light finds them all exhausted, mortified, and wiser. Haha, no, this is a Gaspar Noé film, so everybody suffers terribly for no reason, and at least a few people end up dead or dying. But this it not a film about agony. Fully a third of it or more, in fact, is about as deeply, sincerely blissful as I can fathom a motion picture being. The 97-minute film exists in basically three parts of extremely uneven length. The first of these is one shot of some ten minutes, pointed at a television playing a VHS tape. This is Climax's list of works cited: on the left side of the television are various film theory monographs and works of continental monographs; on the right is a stack of movies, including Dario Argento's Suspiria, Andrzej Żuławski's Possession, and Kenneth Anger's Inauguration of the Pleasure Dome, and by the time the movie is over, Noé will have nodded towards or quoted or outright stolen from pretty much everything in these two piles. While we're given a nice long time to peruse the collection, the entire cast is introduced in the form of their audition tape, identifying themselves and why they want to dance. The film's second part is that first dance, shown as one glorious uninterrupted take that barely moves except to push in or pull back to accommodate a changing number of dancers (it's basically a club music version of the exact same principle Fred Astaire used to insist on in his films), and then a second, much more free-form dance, pointing down from above, as each cast member, one per shot, gets a half minute or so to perform some moves in a circle of their colleagues. Then, 40 minutes or so into the movie, we finally get the credits, and only then does the spike sangria come out, and the majority of the rest of the film plays out in the course of one extravagant long take moving in and out of the auditorium and the hallways around it, taking notice of different people seemingly at random, as they decay and degrade into pure animal instinct. The unifying theme here is the body as a means of expression: the opening dances are absolute unstinting fleshy joy, asking us to soak in the capacity of the human body to move in an endless variety of exaggerated, fluid ways, growing more or less baldly sexual depending on who's doing the dancing and where we are in the choreography. The remainder of the film is much more interested in the loss of conscious control of the body, but it's still all about how emotions and inner thoughts manifest themselves in movement: Noé designed the film so that the first half would be tightly choreographed and planned out, while the second half would involve him and Benoît Debie capturing the cast - almost exclusively made up of professional dancers, with the one trained actor, Sofia Boutella, playing the company owner (which she does superbly, for all that the role doesn't immediately reveal itself as particularly complicated) - as they improvise dance and dance-like moves to express whatever pleasure or hell is coursing through their character's rattled head in that moment. Basically, it's some kind of weird, fucked-up, nihilistic ballet: the plot proceeds more as a list of main points to be covered than events to be depicted, and only twice does the film favor standing still to hear dialogue rather than allow its characters and camera to all move like electrons darting around in a crowded space (and that dialogue is, for the record, pretty disposable and insipid, primarily serving to demonstrate that the characters are all various kinds of horny, and mostly pretty gratuitously unpleasant about it). 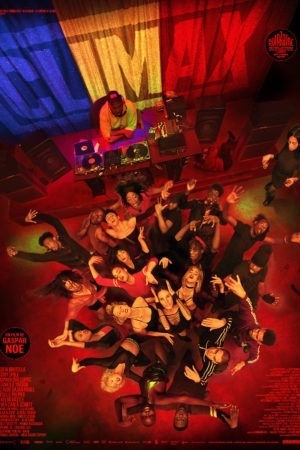 The film's soundtrack is made up of an eclectic mix of old and new songs, but the main unifying principle is a pulsing beat and synthesized orchestration; it is music to dance to, not to listen to or absorb, and by Christ, they dance. To press the effect of all this on the audience, Climax relies on one of the loudest, most angry sound mixes that I think I have ever heard. This is a film that begs to be seen in a theater with the best audio quality you can lay your hands on: it is a movie whose impact - and a more literal impact you'll rarely get in a motion picture - depends on sound waves pounding steadily into the viewer at an increasingly hypnotic rate. If Noé can't have us get up in our seats and dance in front of the screen, at least he can cause our bodies to vibrate at a sympathetic frequency to the movie, and it's a hell of a thing to experience it. The orgasmic pleasures of the film that curdle and turn into something like body horror done in the most realistic possible register are tangible things. All of this is exhilarating until it's not (the film has really only the one or two ideas, and not that many iterations of them), and there's really no denying that the film peaks early: that exquisite long-take dance number, so mesmerising, endless, and overstuffed with joy, really just blows away the rather trite miserabilism of the last 15 minutes. It's also hard to pretend that the film is especially fresh, when Noé so openly tells us his inspirations, and he's not even including how much of this feels like he's re-working ideas from his own Enter the Void. Still, as a single, sustained experiment in communicating bliss and horror through music and movement, and finding a bravura but curiously plain cinematic style to capture that movement, Climax is an absolutely magnificent object. It is a celebration and indictment of the human body made with wholly unmitigated passion and conviction, and even if it's obviously imperfect in certain ways, I cannot think of the last movie that felt so much like a living thing, exploding with an almost terrifying vitality.